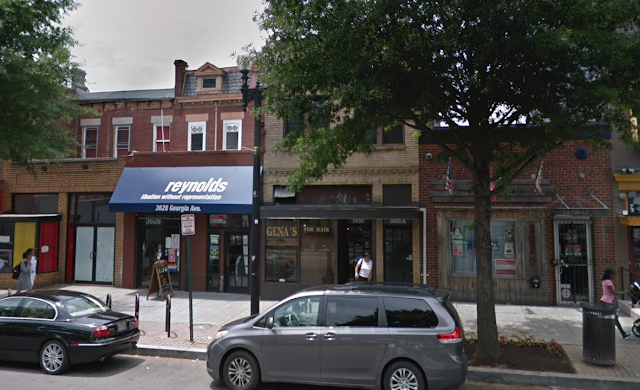 Something is finally coming to the big restaurant space at 2121 14th St NW that was formerly home of Eatonville, Mulebone and Ancient Rivers, all owned by Andy Shallal of Busboys and Poets fame. The new spot appears to be unnamed and has applied for a liquor license. Here are the details via Helder Gil on twitter, who posted about the application. Sounds more like a nightclub or music venue, which sounds good to me. That space has been cursed ever since Eatonville closed. Eatonville was a pretty tasty southern restaurant commemorating author Zora Neale Hurston and lasted five years, Mulebone was also a southern spot that lasted less and Ancient Rivers was a Middle Eastern spot that was barely open. I’ll try to find out more details. Restaurant/beauty shop/skating rink (!?!) coming to 3630 Georgia Ave!? This is pretty wild. The other day I walked past 3630 Georgia Avenue NW, the long vacant storefront between DC Reynolds and what used to be Walter's Sports Bar and noticed a lot of new permits in the window. They were for an incoming restaurant, beauty shop, and skating rink. Yes, a skating rink. The permits are below. We heard earlier in the year that an Ethiopian restaurant had applied for permits for this space, so I wonder if they'll also having skating? The place is two floors, so maybe the restaurant/skating rink is going on the first floor (and basement, if there is one?) and the beauty shop is upstairs? That's how Looking Glass is, with an upstairs beauty shop. According to the city's records, the building was sold in May to "JAMAL'S GEORGIA ROW LLC" which seems to be a misspelling of Douglas Jemal, who runs Douglas Development Co., which also owns neighboring 3628 Georgia, which is DC Reynolds. The permit applications are all filed by 3632 Georgia Avenue LLC, which also ran the now-closed Walters Sports Bar that was next door, which is odd. The former Walters Sports Bar next door has permits in the window for what is soon to be Marrakech Moroccan restaurant. I've reached out to Douglas Development for more info. UPDATE: Walters was a slightly different LLC, 3632 Georgia Hospitality LLC, so they are unrelated. My mistake. It's also possible someone goofed with the skating rink permit, but we shall see. 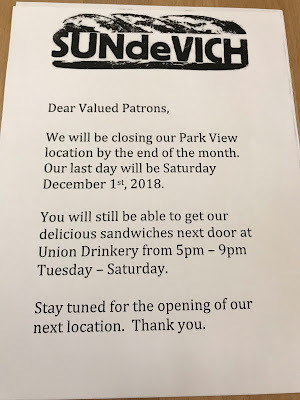 Sad news for sandwich fans, Sundevich has closed its location at 3212 Georgia Ave NW. 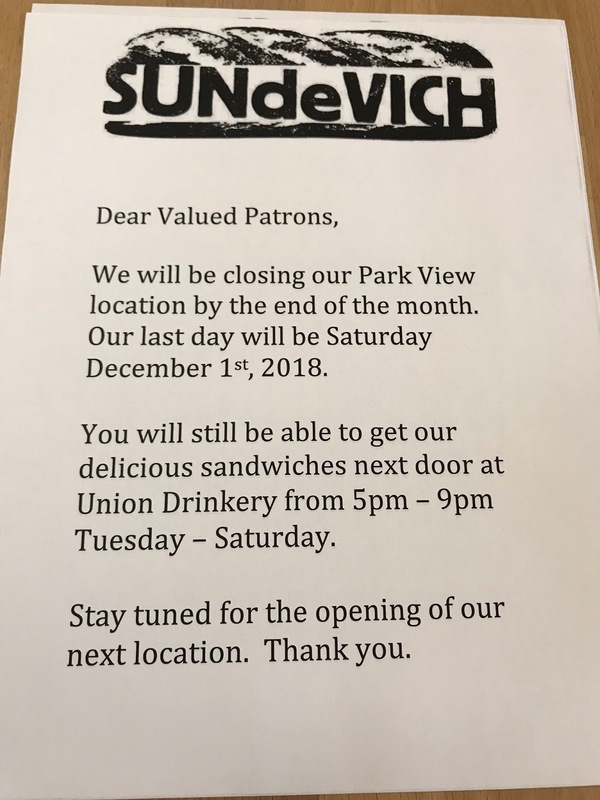 Announcing on Twitter, they said the sandwiches will still available at neighboring bar Union Drinkery, which is owned by the same folks. However, they won't be available during lunch time during the week anymore, just 5-9pm Tuesday-Saturday. I'm not too surprised, the place was pretty empty often, although quite tasty. In my opinion the sandwiches have been getting better over time too. There are still plenty of good weekday lunch options in the area, such as the Coupe and Red Rocks on 11th and Heat da Spot, Call Your Mother and DC Reynolds on Georgia Avenue. DC Reynolds has a nice $9 sandwich, soda and side deal, for example. The Georgetown and Shaw Sundevich locations are still open too. I've reached out to see what they plan to do with the space.